But I thought Bushel was a brand of tea? If you have ever watched TV programs like Stateline, you will hear the term Bushel during the market report. So what is a bushel? A bushel is an imperial measure of volume used in the sale of dry goods, first introduced by King Edgar in the city of Winchester in the 10th century. The use of a bushel as a standard measure to trade salt and grains in England, was officially put into law in 1670. This is also the point in time when the Bushel was resized (3%larger) at 8 new gallons (36.38 litres) to standardise all imperial measurements. This practice of using a bushel continued over hundreds of years, until the introduction of the metric system. To prevent disputes about the size of a bushel, and to assist in regulating industry, governments would hold a standard bushel, from which all others could be measured. 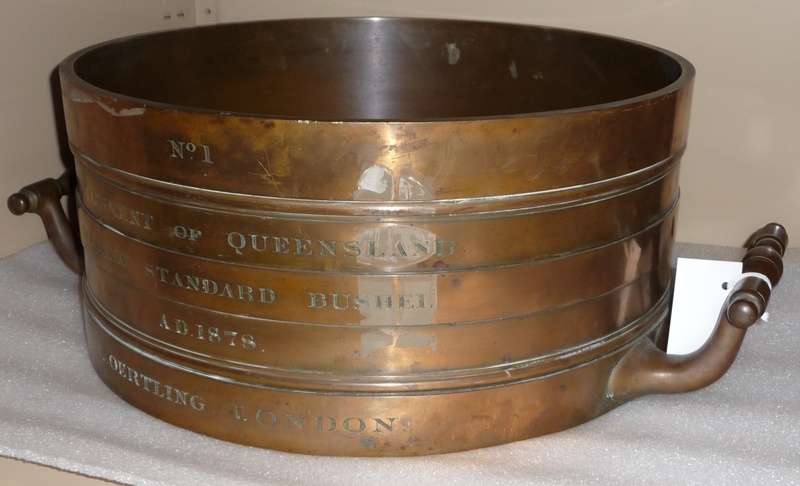 The official Queensland Government bushel is made of brass and was produced in London in 1875 by L. Oretling, the largest and most famous makers of precision weights and measures in Great Britain. This is a fascinating insight into how Mathematics, science and technology has changed over the last 100 years. For more ideas and resources to teach science and technology in the classroom visit QM Loans. Loans kits include Telecommunications, Early Queensland Living and Australian Inventions. For more information on the history of the bushel and other imperial measures have a look at this link.